The support of our family and friends during our journey has been so appreciated. And when that support includes chocolate, it’s just that much more appreciated! Eight months in and with autumn in full swing, the recent round of care packages from home came at a perfect time. So, without further ado, let’s get to unboxing! Shortly before we headed out for our trip to Osaka and Kyoto, a package arrived from Viktoria’s mom. 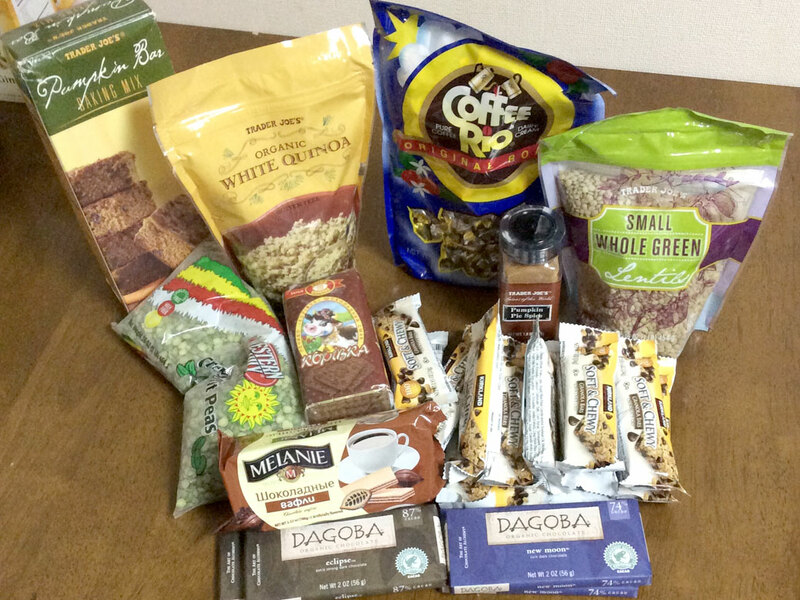 It included some pantry staples like split green peas, lentils and quinoa; dark chocolate from Oregon’s Dagoba Organic Chocolates; Trader Joe’s Pumpkin Bar mix; and a host of goodies from Costco and “The Russian Store” as we all refer to the European-goods store back home. More than a few of these things made it into the backpack for our trip and more than a few of these things have already been eaten. After we returned from our trip, the first of two boxes from Cascadian KronWeld showed up at our door. I only managed a picture of one, but the second box was full of spices that we’ve had a hard time finding. 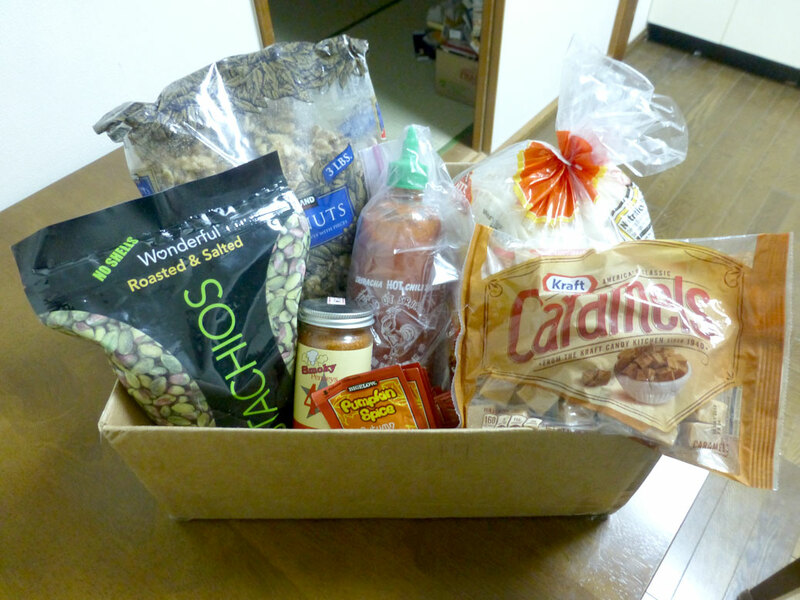 Among the treats were Costco-sized bags of pistachios and walnuts, Sriracha hot sauce, caramels, pumpkin-spice tea and a giant bag of tortillas. Extra-large containers of smoked salts, cayenne pepper and pumpkin pie spice followed shortly. A special thanks to Cascadian Brian for carrying that smoked salt in your car for a couple hundred miles. A special treat worth it’s own paragraph: Pumpkin Pie Almonds (I’m assuming from Costco). These only lasted a little over a week despite the giant bag. Almonds with a pumpkin pie flavored candy coating. Holy $&@^ these things were amazing! Today’s arrival from Cascadian Mama Vera. In other news, Justin’s Peanut Butter stock is through the roof. Today, I heard a faint ringing while washing the dishes. Fortunately, I investigated as it was the mailman delivering a package from my mama. This one had some odd specific requests (which I chose not to include in the photo, but Thank You Mom!) 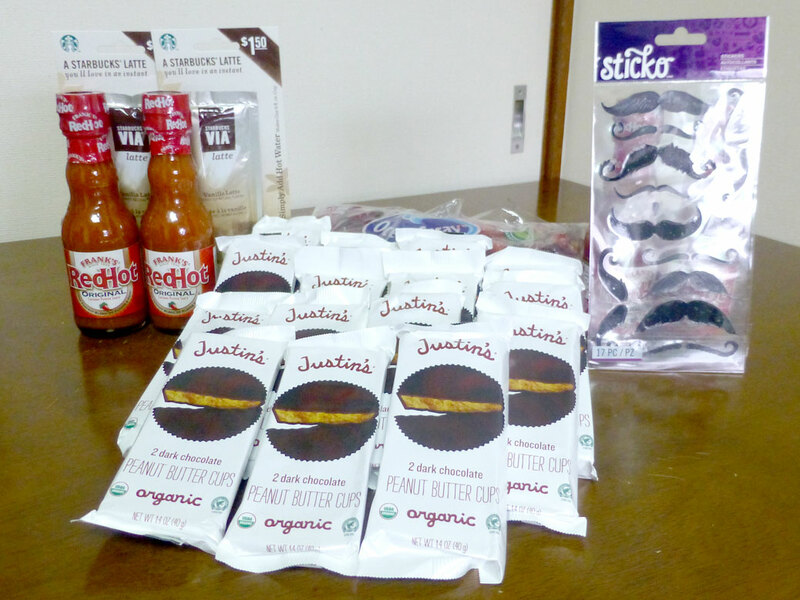 as well as some creature comforts from home, such as Frank’s Red Hot Sauce, every package of Justin’s Dark Chocolate Peanut Butter Cups on the Oregon Coast, fresh cranberries (which were still cold after a week in transit), Starbucks instant lattes and some static-cling mustaches, which I’m certain will end up in some interesting places. Thanks again to everyone for your support during our adventure!